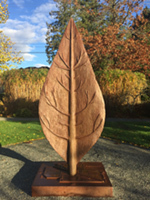 The sculpture is in Fleetwood Park, 15802 80th Ave. Use the entrance on the south side of 80th Ave at 159th Street, turn into the first parking lot. The sculpture is in the area of the formal garden. A plaque nearby describes the artwork and its significance. On the web, a pdf file describing the public art is available. Thompson Foundry to realize this sculpture."